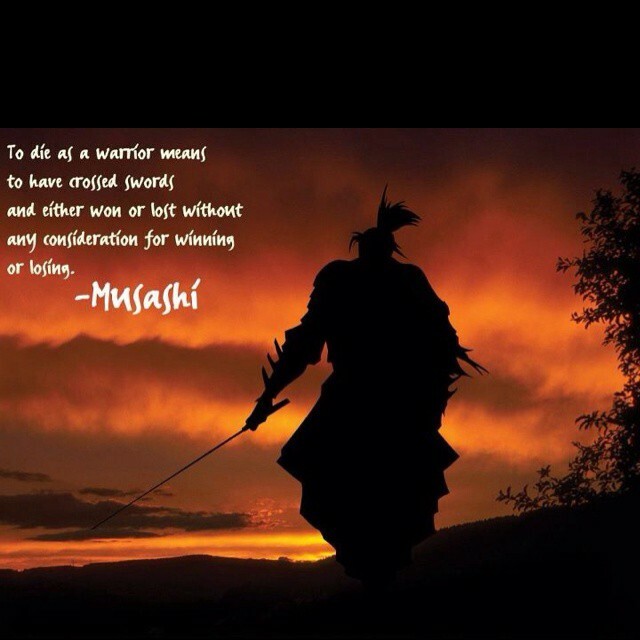 Miyamoto Musashi was a ronin (an unattached Samurai), fighting duels as physical philosophy. 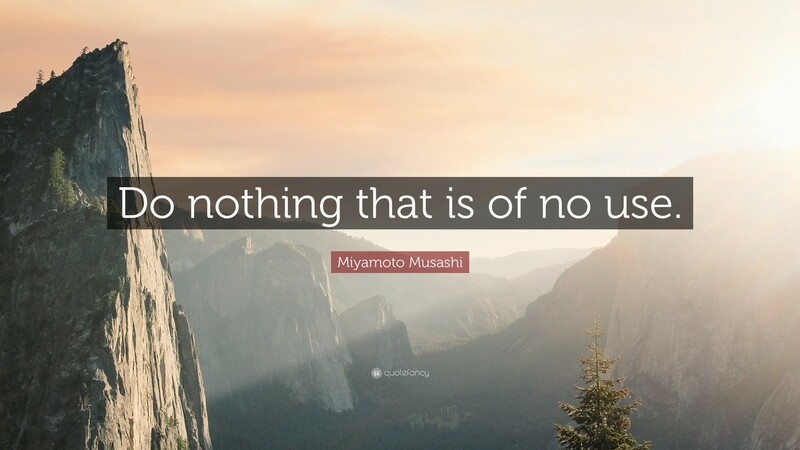 His unique fighting style, with sword in each hand, was known as the “Ni Ten Ichi Ryu” school, and Musashi remained an undefeated warrior, artist, philosopher and teacher. He wrote his classic Book of the Five Rings around 1643. His life exemplified balance in all things at all times. Probably Musashi’s most famous duel was against Ganryu (Sasaki Kojiro) in 1612. This Long Sword expert was beaten by Musashi using only a wooden pole, and great balance between mental and physical strength and agility, and therefore psychological outmaneuvering — Musashi’s ‘lateness,’ moving at deliberately slow speed, then quickening rhythm, made Ganryu lose his self control and therefore the dual. 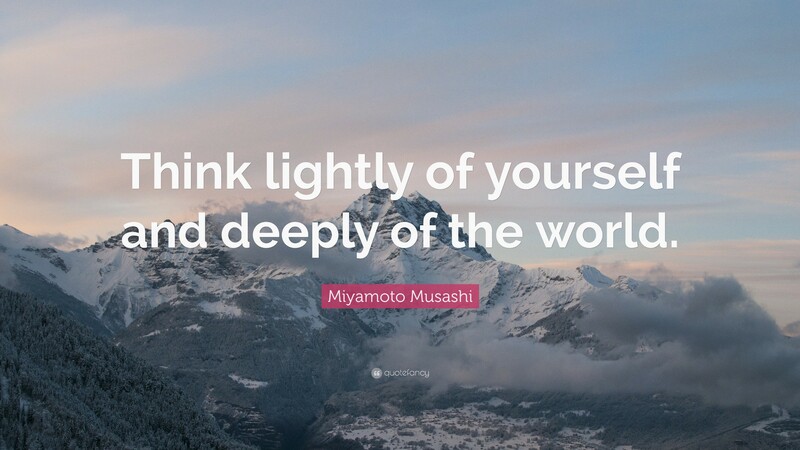 The combination of skill and psychology became Musashi’s trademark. 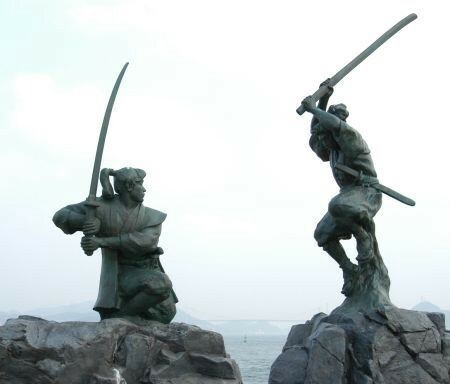 Sculpture commemorating the duel of Ganryujima between Musashi Miyamoto and Sasaki Kojiro. Hosokawa Sansai Governed Buzen prefecture at the time this dual took place and gave Musahi permission to fight the duel. Many believe that he fought and survived against numerous Tokugawa forces during the early 1600’s until the Edo era, when he increasingly spent his time seeking the wider truths of his “Way,” and continued his study of Zen Buddhism. “To move the shade,” “Holding down a shadow,” and “Time can be passed on,” are three of his fighting philosophies. Two further quotes from Musashi’s Book of the Five Rings give further meditative value — on the balance of opposites.